Fuji FP-100B Professional Instant B&W Film ISO 100 is an instant 3.25 x 4.25" peel-apart black-and-white pack film that demonstrates high-quality, sharpness and resolution (daylight type). Uses include cameras and other photographic equipment that accept instant film with a photo size of 85 x 108mm, and those provided or fitted with an instant camera back (e.g. Fuji Instant Back PA-1) and Fuji Instant Holder PA-145. 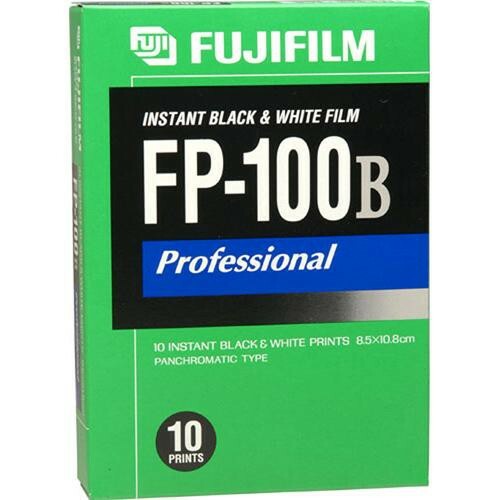 FP-100B Professional Instant B&W Film (ISO 100) (10 Exposures, Glossy) is rated 4.5 out of 5 by 51. Rated 5 out of 5 by malanis photography from The best gadget to impress clients! Originally used as exposure / composition test, I have found a more powerful use for this product. Recently at a photo shooting, I had a couple having the time of their lives at the studio. They were really enjoying the photo shooting. Besides shooting digital, I usually shot a few rolls of B&W negative film on 120 mm. Everyone loves the results. While shooting with my Bronica on film, I mounted my polaroid back just for the good ol' times. When I pulled the pola print out of my camera, everyone in the studio was impressed by having a picture instantly out of something that was not digital. COOL! Rated 5 out of 5 by DAMiller52 from Great instant film This product is great to use with the 100 back for Hasselblad medium format. It is perfect to set up shots, check lighting & etc. Rated 4 out of 5 by bicyclepirate from accurate instant film I use this film on my Hasselblad and I feel it gives accurate tonal range. However, because I do not shoot with b&w Fujifilm in my camera, I feel the representation in the instant film has a more exaggerated contrast than what I capture on non Fuji film. Rated 5 out of 5 by Anonymous from This is a very good product I use this product to test the lighting while working in the studio with a 120 camera. What makes it really great is that I am able to see the results very quickly and change the lighting depending on what I see on the film. I use it just as a test before I shoot a roll of film. It saves me from making improper exposures on my entire roll of film. Rated 5 out of 5 by Scott from Instant Fix If you have pack film cameras or backs and still want to use them, there aren't many choices left. Fortunately, this is a good one. I still have many Polaroid pack cameras in good working condition. Although I use mostly digital, I still have that Polaroid Passion! Much more intimate and working with this film requires you to slow down and think. Which can be a needed relief from banging away on the DSLR. And instant photography is novel again, now that a generation have grown up without it. Rated 5 out of 5 by Anonymous from Love it. I am a professional photographer. Often I am working on location in medical/research situations. Presenting a full tone, high quality finished image is a nice way to say thank you to subjects who have volunteered their time. In truth, they love it. Rated 5 out of 5 by labmgr from awesome. glad to have found this one as a replacement for the polaroid 667 as our lab unanimously prefers the b&w to color for our gel photos. wish we could buy in larger quantities, possibly by the case?